Hiking Buddy E and I finally had the opportunity to take a real hike together a couple of weeks ago. We chose the Vineyard Trail which leaves from a parking area at Roosevelt Lake, an hour plus drive from Gold Canyon. Now here’s the thing about the Vineyard Trail: it begins with some rather steep climbing. In fact, we had to gain some 1100 feet in the first mile and a quarter of the hike. Being ‘of a certain age,’ and having a kind of hinky hip these days, this took some amount of effort for me. E., however, is a gazelle. The footing was nothing to be happy about either – lots of loose stones and small rocks on the well-maintained trail. Not much of a problem going up, more of a problem coming down that steep part. We were lucky that we were on the trail only a week after about 5 inches of rain fell. The path would have been a lot more slippery had it been very dry, I think. Now you know the only negative thing I can say about this hike. Otherwise it was Perfect with a capital P. On the way up we enjoyed stunning views of Roosevelt Lake and the gracefully arched bridge that spans a part of it. Roosevelt Lake was created when Roosevelt Dam was completed in 1911. Both named for and opened by President Theodore Roosevelt, the dam was part of the Reclamation Act of 1902 which funded irrigation projects in twenty western states. The lake the dam created is 22.4 miles long and has a shoreline of some 128 miles. 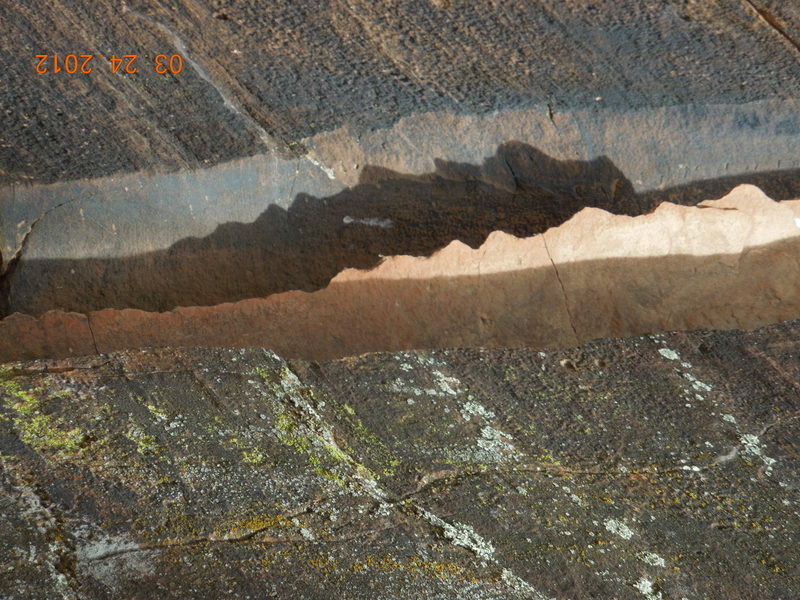 It holds a lot of water (1.6 million acre feet) and has a maximum depth of 188 feet. Best of all, it’s just plain beautiful. I’ve said it before and I’ll say it again: people who think the desert of the southwest isn’t green just haven’t seen it. This was identified on our hike description as a ‘radio tower.’ To us it looked more like a white board – something of a mystery, but a good landmark nonetheless. This was a real ‘bear went over the mountain’ hike. That means that E would reach the crest of a hill and call back down to me, “Bear!” meaning that she saw not the wished for distant view but another hill to be scaled. (“The bear went over the mountain, The bear went over the mountain, The bear went over the mountain, to see what he could see. He saw another mountain, He saw another mountain, He saw another mountain,and that is what he saw” – children’s song set to sing-songy tune). At last, though, we reached a high point with a lovely view off to the south. 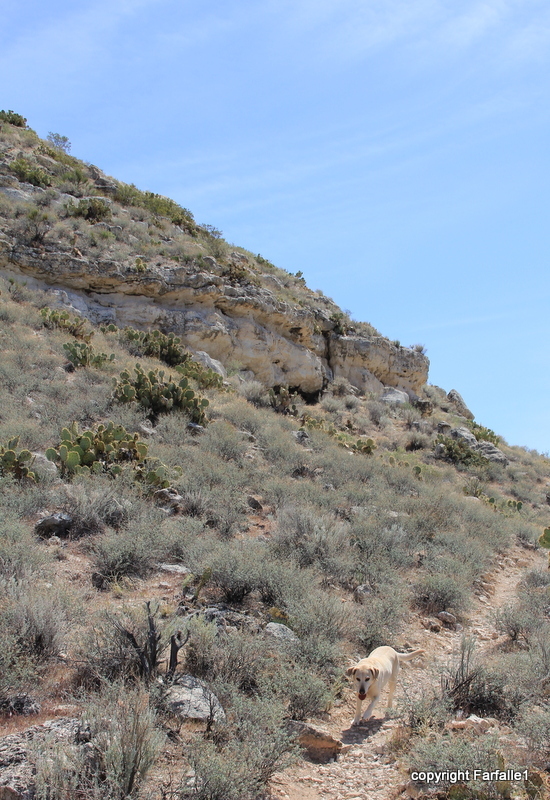 The trail leveled out for a while as we walked along a crest. At a certain point there was bit more of a climb and a turn in the trail and then, Voila! Snow-bedecked Four Peaks looking much closer than I had thought it was. What a sight. We don’t get snow here that frequently, but the aforementioned 5″ of rain was snow on the mountain tops, and it stayed for almost a week. Four Peaks is a highly visible landmark from many parts of the Phoenix Valley, but I had never seen it from this particular angle before. We’d been walking long enough to feel a little peckish. And as if on cue, the perfect picnic site presented itself: a saguaro forest. 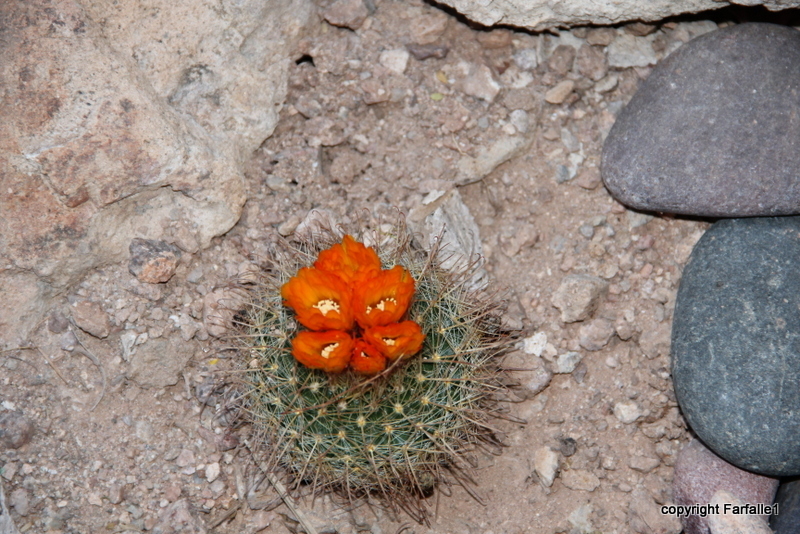 Our path led along the base of this handsome, ancient and undisturbed stand of cactus. We found an excellent flat spot and had a splendid meal in the shadow of these giants. Shortly afterwards the trail led sharply downhill. Thinking back on how tough the up had been, we decided not to penalize ourselves with another difficult climb back by continuing down. So, feeling a little sad that we had not reached the end of the hike (or anywhere near it, as it turned out; it’s 6 miles one-way and I calculate we hiked in only about 3) we began to retrace our steps. The views were, obviously, completely different on the way back and were even more beautiful than before. As we got back towards the dam we saw the Salt river snaking down its valley, with the picturesque Route 88 draped over its shoulder. Soon we were presented with a terrific aerial view of the dam itself with the bridge in the background. Far in the distance you can barely see what I think is part of the White Mountains Range (or perhaps even Mt. Baldy?) – or I may be completely confused. This photo gives an idea how steep the climb back down was – in many ways harder than going up. With the climb up the problem was simply catching one’s breath, going down had some tricky footing – so I spent most of my time looking down. Which was nice, because I saw some rather interesting rocks. This one got me wondering if it had been shaped by weather or by human hands centuries ago. This one looks like what I see in the mirror every morning. Just kidding! I love the juxtaposition of sharp cracks and rounded shapes. I wasn’t sure I’d be able to walk up our driveway hill when we got home, but I did! And then made my way immediately into a hot tub of very hot water. At the end of the hike I said to E, “I don’t think I could do that one again.” But you know what? I’m ready! Let’s go this weekend!! This clutch started out numbering 13 fluffy yellow chicks, and is now down to 8. Why is it baby bunnies are so cute? We KNOW they would love to come in the garden and eat everything that’s there, but still they are irresistable. They are quite large but harmless, unless you happen to be a small rodent. We’re happy to see them as it means the population of chipmunks and pack rats will decline. Gila monsters are not uncommon, but they are shy, so my hiking buddy and I were delighted to see this fine fellow last weekend. 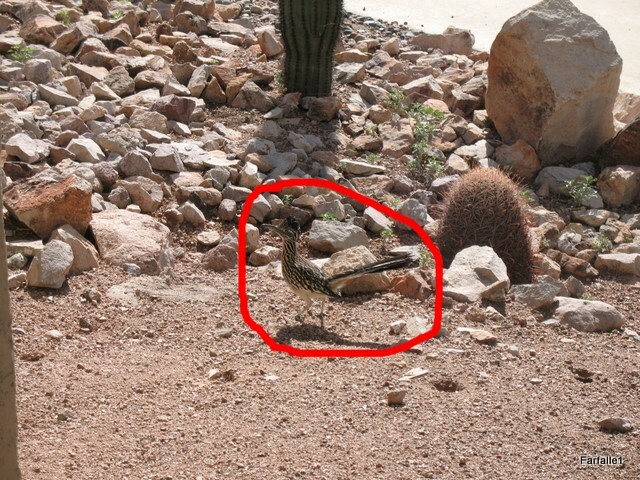 In all the many hikes we’ve taken together this is only the second time we’ve seen a Gila. Chuckwallas live in the rock pile next to our house, so we see them on almost a daily basis. They can be quite fearless and let us get rather close; but somehow I don’t want to get too close! Their tails look like they were taken from some other lizards and glued on to the end of tailless chuckwallas, they just don’t look like they belong to that animal. A couple of days ago Speedy noticed a pair of smaller lizards on the rock wall out in front. 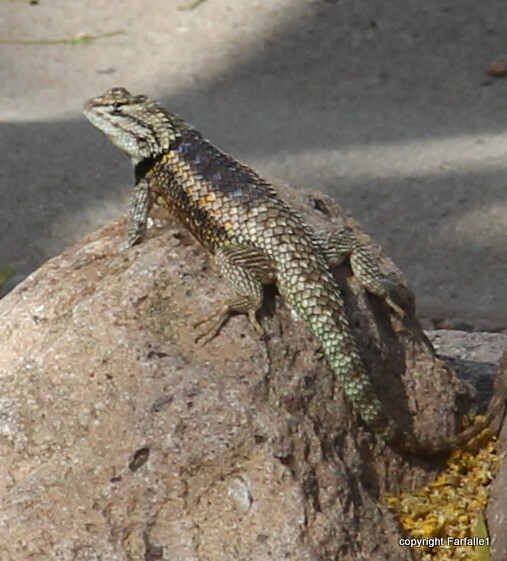 I was not able to get very close to them, but I think one of them, at least, is a Mountain Spiney Lizard – and it’s the first time we’ve seen one. 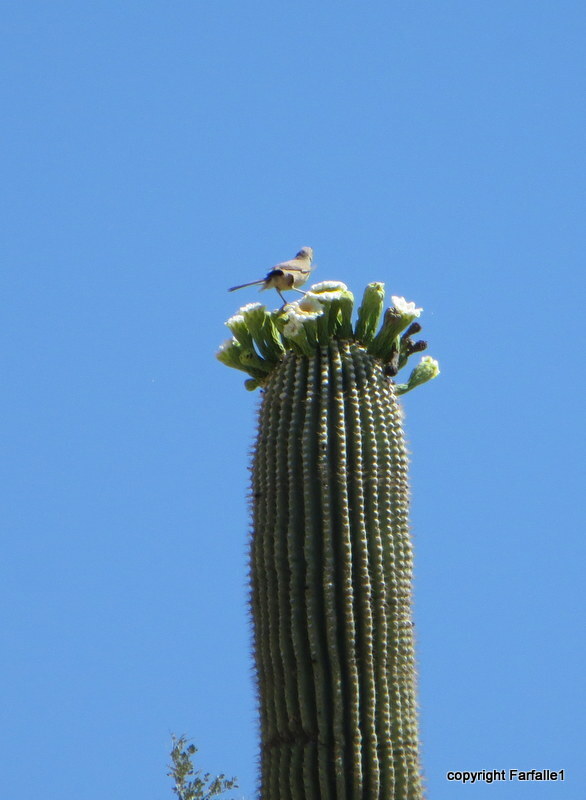 The cactus have been blooming for some time, but this year we’ve had another first-time treat: we’ve been able to see the saguaro bloom. 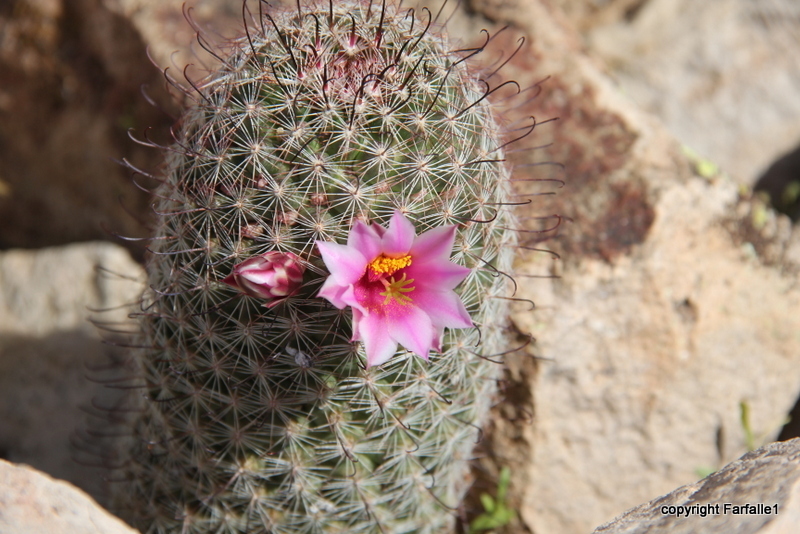 One thing that amuses us – frequently a very small cactus will put out a disproportionately large flower. 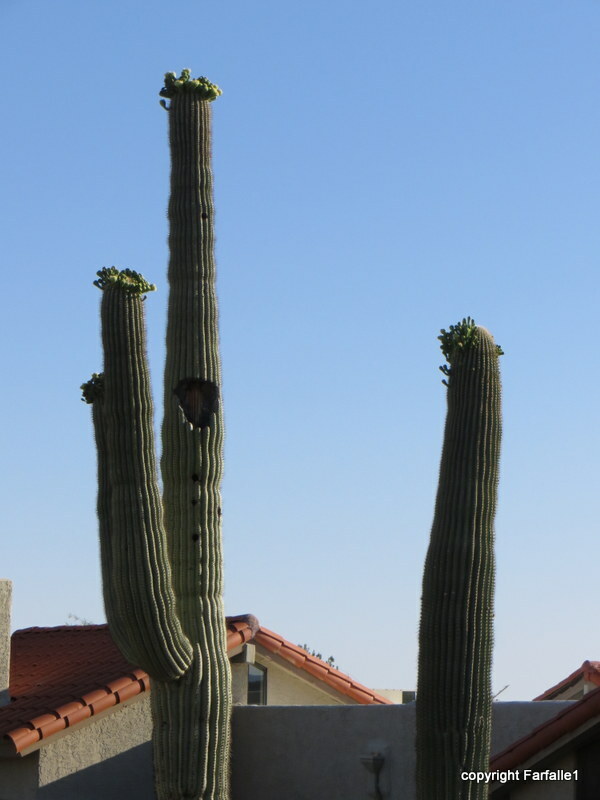 The saguaros, which are huge, put out disproportionately small flowers – from a distance they look like your grandmother 10 minutes after her departure from the beauty parlor, before the perm has relaxed. If their flowers were in proportion to those of the wee cactuses they would be about 3 feet across (I would like to see that). At any rate, I’m thrilled to have finally seen these flowers in person. Spring is lovely no matter where you find yourself. But with the temperatures creeping up towards 100 F Speedy and I find it is time to head east… waaayyy east. Next stop: Rapallo, and a different kind of Spring. See you there! It means ‘without water’ and if you’ve spent time in the Arizona desert, you know it’s appropriate. 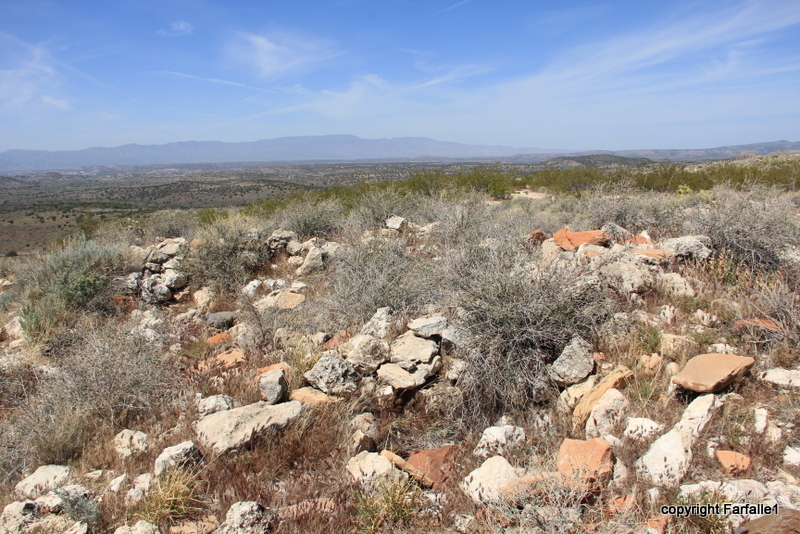 The Sinagua were a group of Indians who lived in the Verde Valley from about 1000 to 1400 AD or so. What became of them is a mystery, though one theory is that they left their own pueblos and were absorbed into other tribes, perhaps after a long period of drought. Photo of National Park Services informational sign. 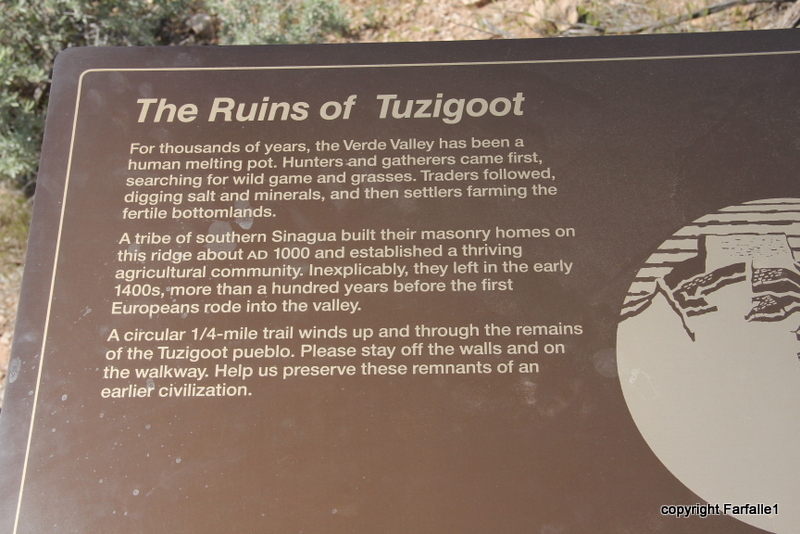 Tuzigoot, a fascinating restored Sinagua pueblo, is a National Monument near Sedona, overseen by the National Parks Service . (It’s also a wonderful word and fun to shout at unsuspecting strangers.) At nearby Sacred Mountain you can see what the remains of Tuzigoot probably looked like before the Civil Works Administration put people to work on the site in the 1930’s. 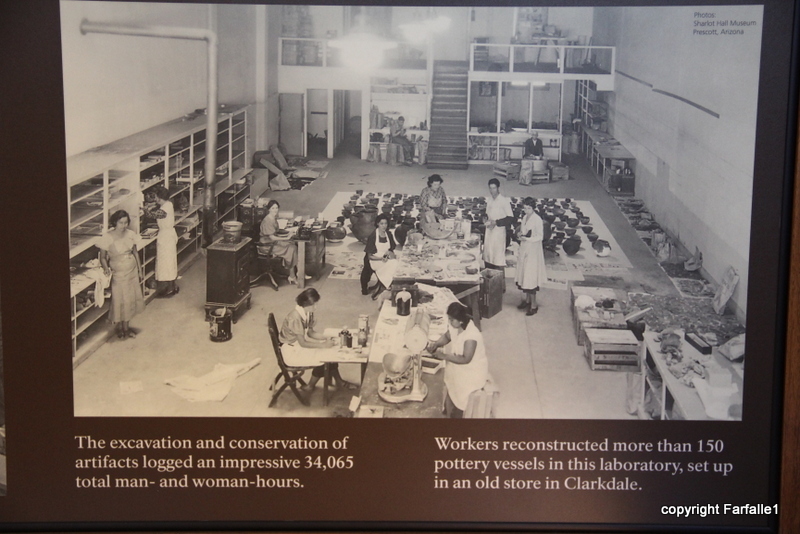 During the Great Depression there were plenty of people looking for work in the region after the copper mines shut down. 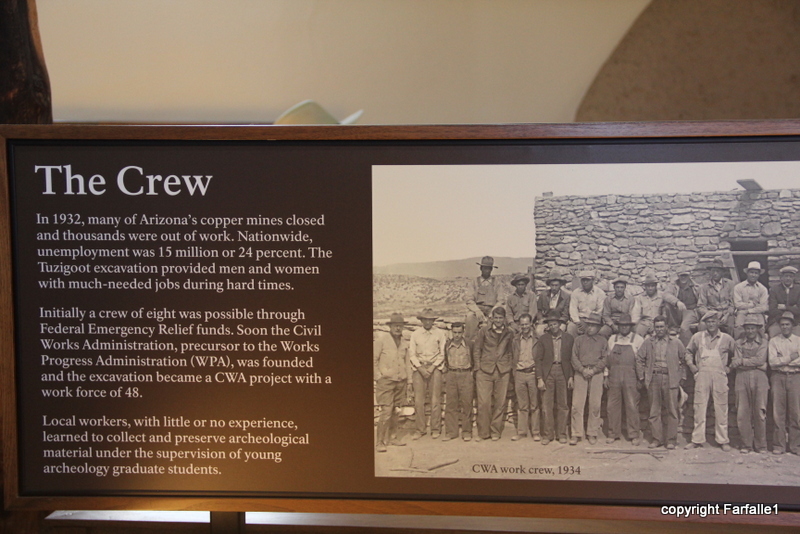 From a work group of eight, the excavation party grew to forty-eight men who learned to be archologists by working this site without previous experience. Fussy work is women’s work. The ladies got to take the zillions of pieces of pottery and so forth that were found at the site and piece them together. 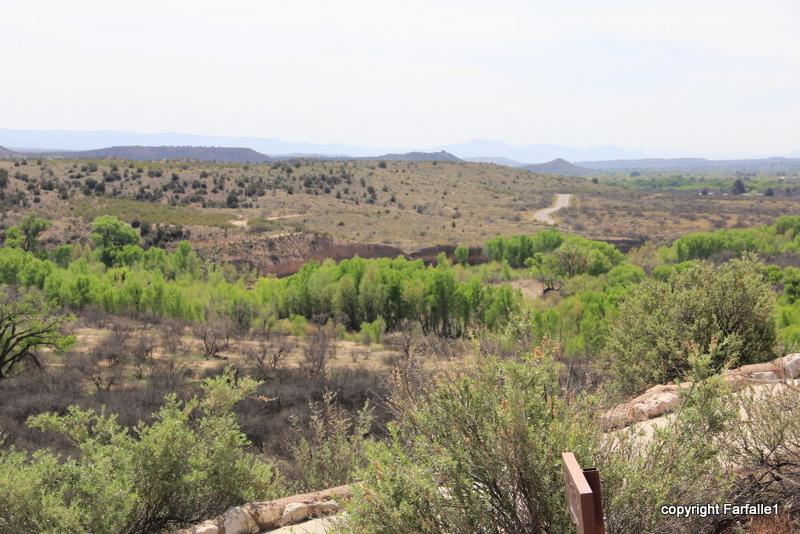 The appeal of the Verde Valley to the Indians is obvious – water! It’s not hard to figure out where the river is. The Indians lived on hilltops – I assume for security – but irrigated and gardened in the flats below. More fussy women’s work – carrying water from the river to the pueblos above. Here’s the path they may have taken at Sacred Mountain. Not steep-steep, but give me a faucet with running hot and cold any day! 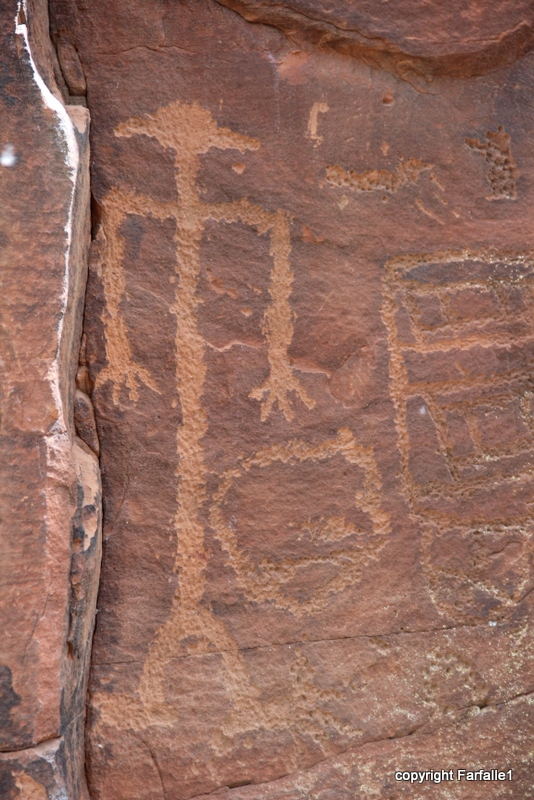 While the Sinagua didn’t read and write by our definitions of those acts, they certainly had a sophisticated method of communication: petroglyphs. Found all over the southwest they presumably gave information about people, places, hunting, planting – all the important aspects of the Indians’ lives. The guide at the V Bar V petroglyph site, adjacent to Sacred Mountain, told us that one interpretation of this design is that the ladder shape traced the seasons of the year, culminating in the summer monsoons, depicted as a swirling circle. The sun hits different parts of the ladder at different seasons, so it may have served as a calendar. Maybe. 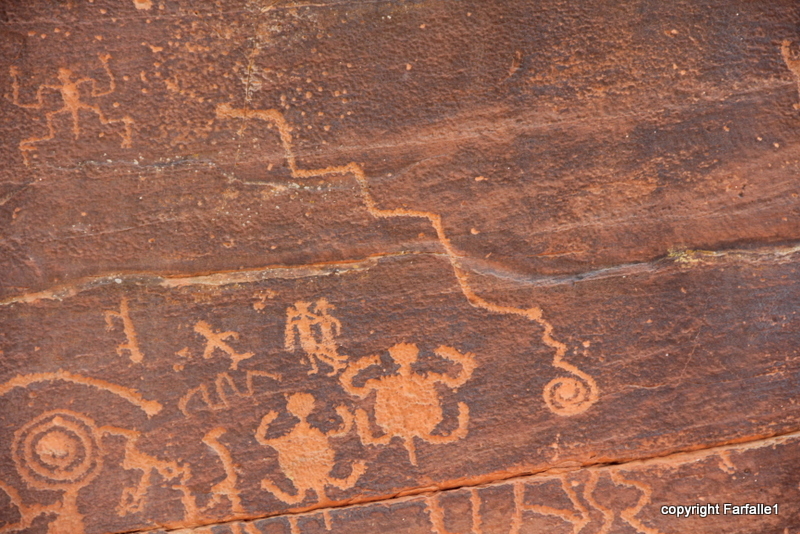 The guide reminded us constantly that we have no way of knowing for sure what any of the petroglyphs mean. This rock is fascinating. Each afternoon the sun strikes the forward carved piece, placing a shadow on the rock behind; the shadow has the exact configuration of the nearby San Francesco Peaks – it’s a map! This photo was taken by our friend and host JBH. 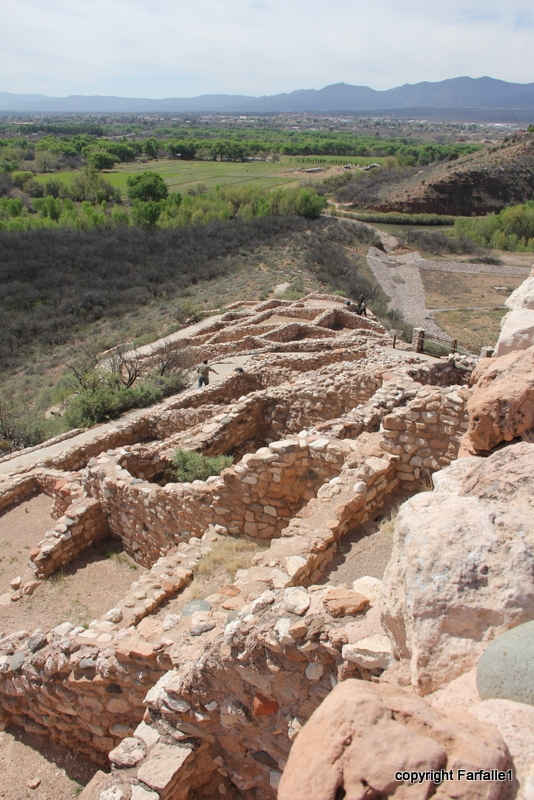 About fifty Sinagua pueblo sites have been identified in the Verde Valley region, an area that encompasses the National Park sites of Montezuma Castle and Montezuma Well. (By the way, Montezuma wasn’t born until a century after the Sinagua left, and as far as anyone knows he never lived in the eponymous castle or drank from the well.) One wonders how many other sites there may be awaiting discovery. I’m already looking forward to exploring again next year! I went out to the garage to get something, and after a few minutes back in the house I felt a sharp sting – the unmistakable feeling of something small defending its territory in my trousers. Ouch! Pants quickly off and shaken, a teeny sandy, orangey scorpion trembled, terrified in the pile of the carpet. It was literally a half inch long, or less. Which is lucky for me. 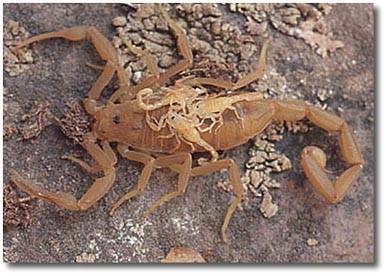 There are many varieties of scorpion inhabiting the southwestern desert. The Arizona Bark Scorpion, seen above, is venomous and can, in certain individuals, cause seizures. 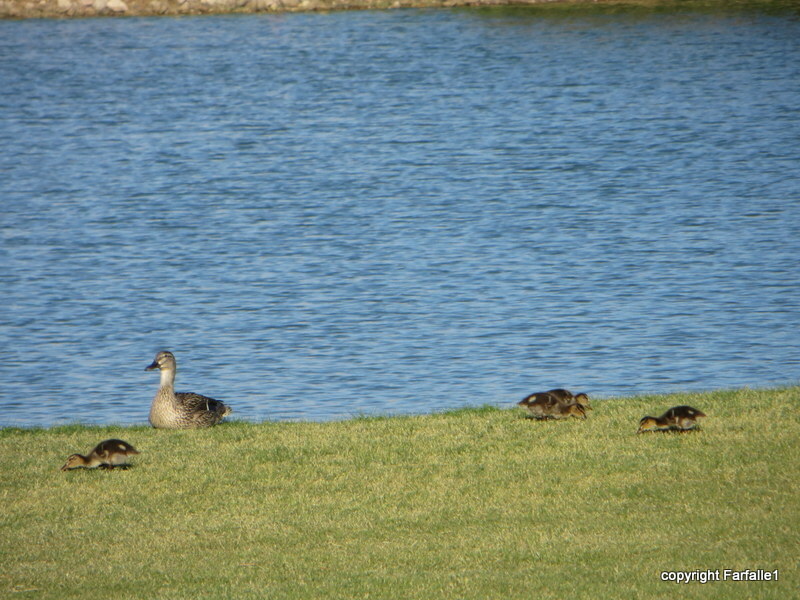 My little guy was either a baby or an altogether different species; we didn’t keep him around long enough to ask him. My heroic Captain whisked him away on a paper towel and set him free outside, where he belongs. The sting site got a little red, a little puffy, and was off and on sore for the rest of the night, but by the next morning I had forgotten I’d been stung. There are scorpions in Italy as well. We frequently find small black ones in various parts of the house. Sometimes they are dead and dessicated, sometimes they are quite lively. For well over a year a little fellow lived under the baseboard next to Luciano‘s supper dish; we assume he came out at night to scarf down kitty scraps. During the day he hid in the safety of his baseboard with only his larger claw partly visible, like a child who thinks he’s hiding because he can’t see you. We got pretty fond of Blackie, especially after we checked with the vet and learned that in the off chance that he stung Luciano, there would not be any major trouble. Little Blackie stayed with us even after Luciano was gone, and in memory of our funny cat I sometimes put down a crumb of something for his baseboard buddy to eat. Then we had an infestation of ants, as sometimes happens in spring. Without thinking we spread poison along the ant trail which happened to lead along Blackie’s baseboard. That was the end of him. We felt pretty bad about that. So, are scorpions dangerous? 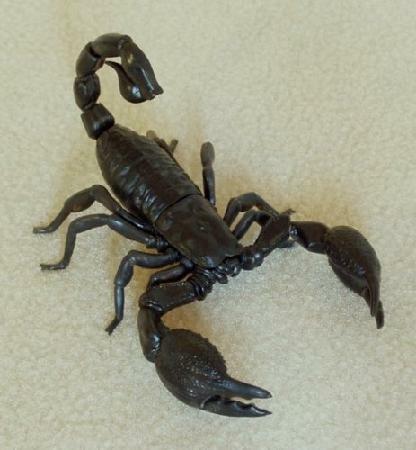 Clearly the Arizona Bark Scorpion can be, though Dr. Trisha McNair reports that of the 1,400 scorpion species worldwide, only about 25 have venom that can kill a person. European scorpions in general are a nuisance at worst, their sting being like that of a bee or wasp. There’s more on scorpions here from Dr. McNair. But toxic or not, I can tell you from experience you don’t really want them crawling around in your pants! We last met the goofy roadrunner in this post about desert camouflage. 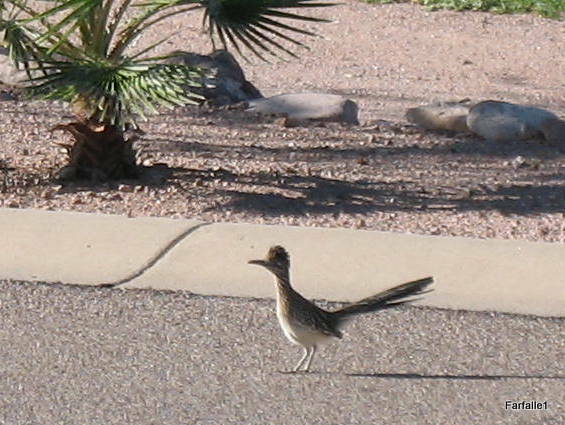 When does a roadrunner stop being goofy? When it’s a female sitting on her nest; then a roadrunner becomes sweet and vulnerable (for probably the only time in her life). She remains, however, well camouflaged. These photos are thanks to the Captain, who has the eaglest of eyes. 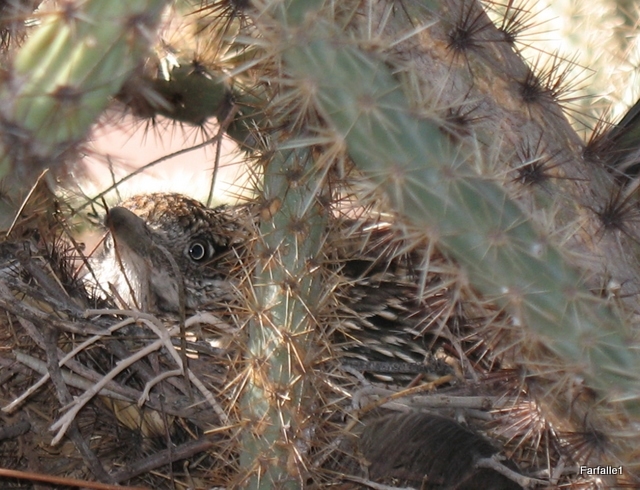 He heard a cardinal singing, and when he looked for it his eye fell on the roadrunner in her nest, well and truly hidden in a protective cactus. Still difficult to see, isn’t she? It’s hard to imagine being a baby anything and having to find your way out of such a prickly nest; on the other hand, no doubt those nasty spines will keep predators from the sitting bird and the new hatchlings when they arrive. Desert walks and hikes are always a joy, but I’ve always been surprised by how few animals we see when we’re out in the wild. 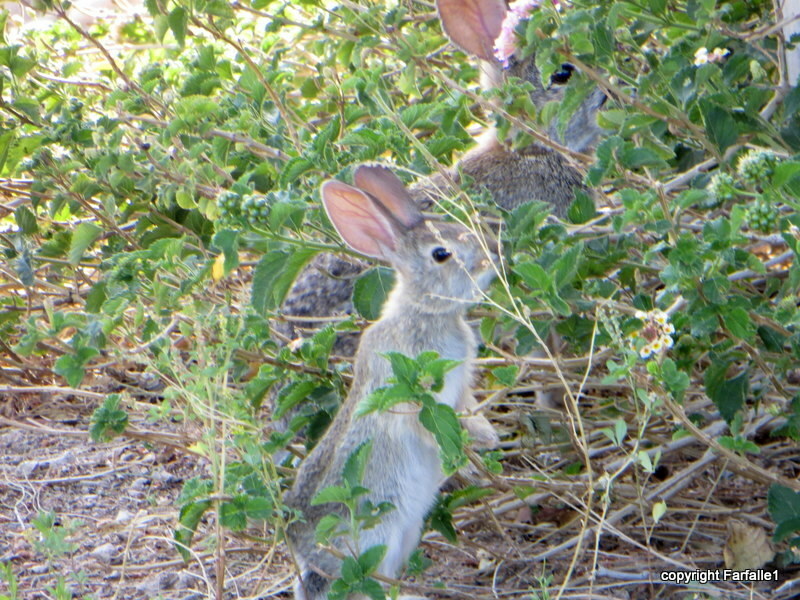 For sure we can count on the gila woodpeckers and the cactus wren, but what about the larger and more exotic animals? I have yet to see a bobcat, though I know they’re all over. The only javelina I’ve seen have been at a golf course, of all places. I would think I was in heaven if I caught a glimpse of a mountain lion, but as they can want as much as 200 square miles of territory, that’s unlikely to happen. 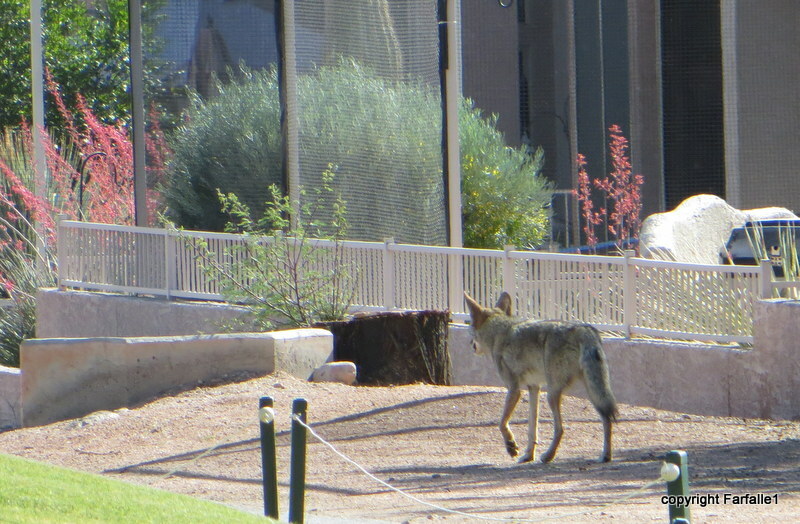 Even the ubiquitous coyotes are far more visible in our neighborhood than out in the desert. Amusing as they are in appearance, roadrunners are actually not very nice birds. They’re carnivores, and are quick enough to eat rattlesnakes (I’d love to see that show – but then, I’m still waiting to see a rattle snake in the desert, or a roadrunner in the desert, for that matter). What they do to their unwanted runt hatchlings is not a fit topic for a general interest blog. So maybe it’s not that the animals aren’t there – it’s just that I’m not clever enough to see them. For me it’s too bad they wear cloaks of invisibility; but for them it’s probably for the best. 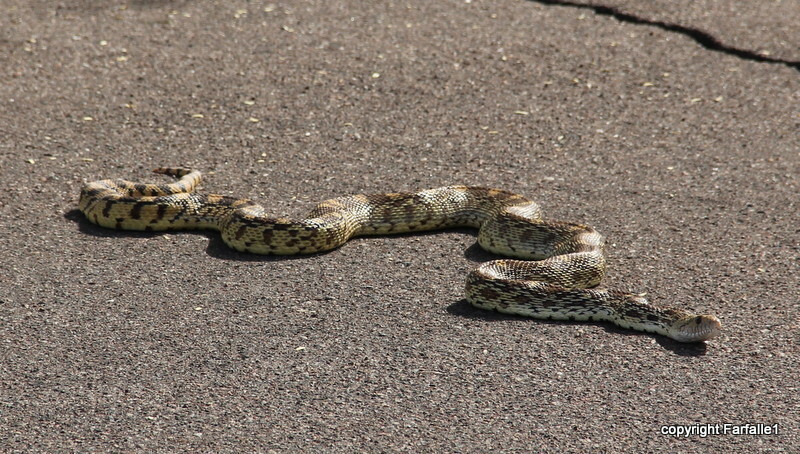 They say there are rattlesnakes in Arizona. HB can tell you I’ve gone out of my way to find one, but have been unsuccessful so far. It’s one thing to see a snake in a nature center or zoo, but I think it would be quite thrilling to see one in its natural habitat; my friends here think I’m nuts. 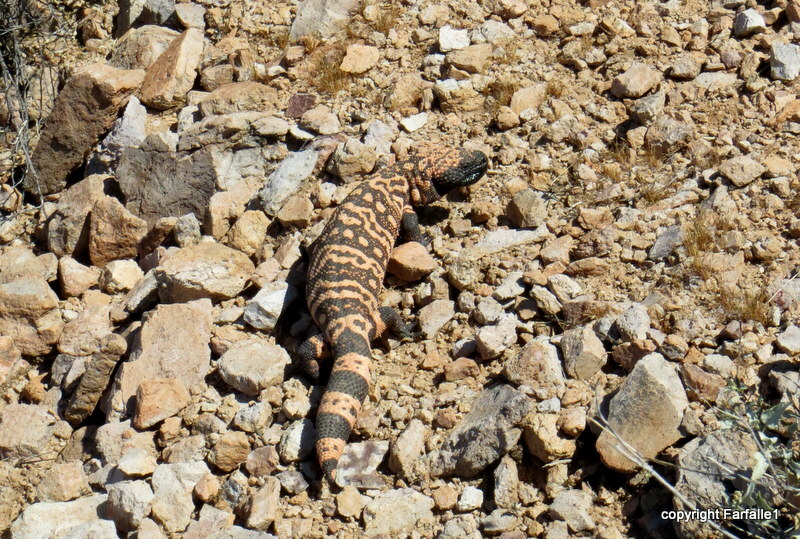 HB and I did see a gorgeous gila monster on one of our hikes. He was about 15 inches long and, HB tells me, very healthy, his chubby tail being the measure of his well-being. Gila monsters are venomous, and while they are sluggish, if you were to step on one by myself he would probably bite you. And he wouldn’t let go. You would have to get yourself to the hospital quickly, with the animal still attached. 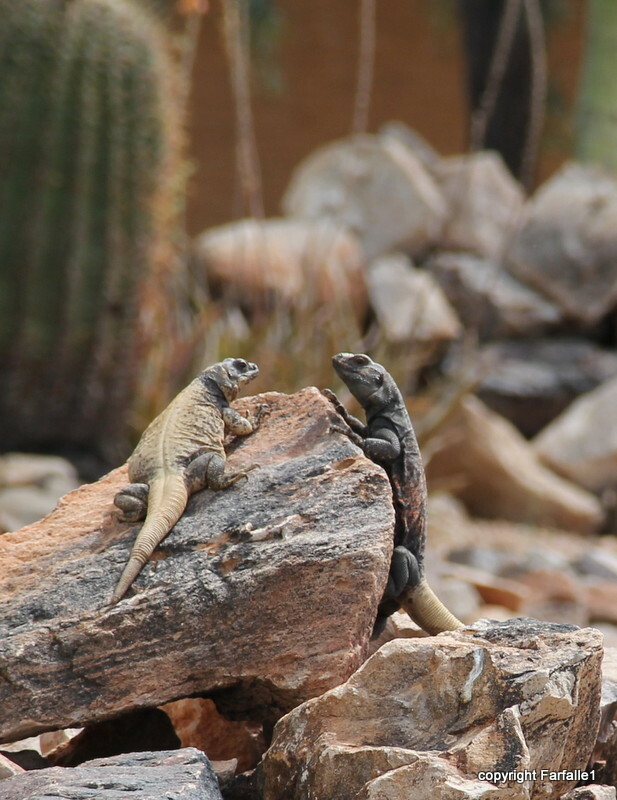 That story would not have a very good end for either of you, especially the gila monster. 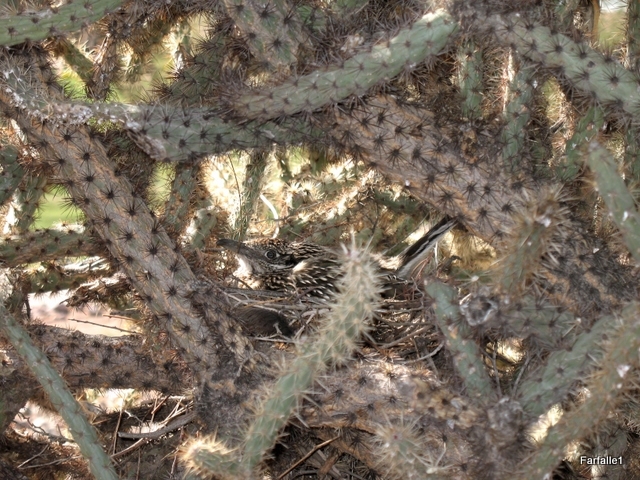 There are several varieties of small lizard resident in this desert. This one was sent over by central casting – he posed fearlessly as I stalked him with my camera. One of the best things I’ve come upon in the desert was this egg. It’s about 2 inches long, and I have no idea whose it is. I was stalking another, larger lizard when I found it. Maybe it’s full of hundreds of wee snakes; or maybe a lizard will pop out one day soon. It’s hard even to find him, isn’t it? I’ve mentioned the birds and bees in an earlier post, but now that there are so many flowers in bloom there are also a great many butterflies. Have you ever tried to take a picture of one? They are fast! No sooner do you get your camera turned on than they zip off to a distant flower. A beautiful swallow-tail visited our citrus tree at home the other day, alit briefly on a glossy green leaf and then raced off. It’s hard to know how something that looks so frail and delicate (and in fact is frail and delicate) can move so fast (between 5 and 30mph, according to The Children’s Butterfly Site. The desert sometimes seems dry and lifeless, but there’s a lot happening out there, and it’s really fun to go hiking and look for the action. Just be careful not to step on a snake or a big lizard!